Random Anny .Com: Free Batteries Start ... NOW! Free Batteries Start ... NOW! 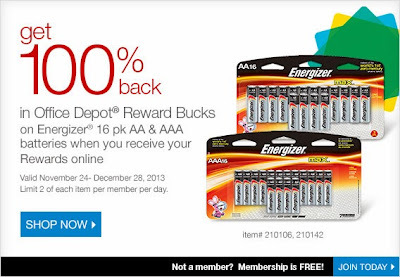 Office Depot has kicked off their yearly battery-thon! 1. Office Depot accepts coupons. Energizer sometimes has coupons. 2. Free shipping kicks in at $50 so you don't need to go every day. Buy 4, wait for delivery. I placed two orders today for in-store pick-up and used coupon code 31067892 for $10 off a $30 purchase. If I wanted delivery I would use a $10 off $50 coupon code. Now it REALLY feels like the Black Friday season has begun!